This years gift giving was a little different. I do make a lot of the gifts we give. I love homemade and I love the thought and effort put behind the gift. When you take the time to give something to someone that would be beneficial to that person or is something that person has an interest in, well, it says a lot to me. With this years gifts, I wanted to put some of my herbal knowledge to good use. One other thing I made my family was a Peppermint Lip Balm. It works beautifully. 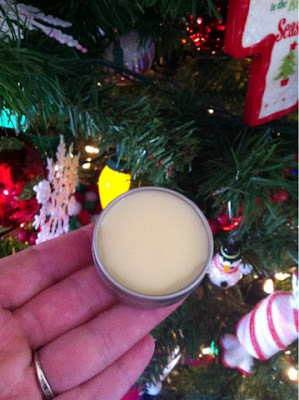 It smells great and it has a little tingle of peppermint, which I find refreshing! Making lip balms is easier than one might think. There is a general rule when making a balm. Then your essential oils and or butters. I wanted it to be very nourishing and I knew these three would make a lovely lip balm. Melt the oils with the beeswax in a double boiler, don't boil, just melt. Then I added peppermint essential oil. Probably about 10 drops. I put the oil in these little containers and made a label for each. We have been using ours since making them. It's nice to know exactly what is in your beauty product. Makes me a bit more eager to make up a few more of my own cosmetics. It's great fun. 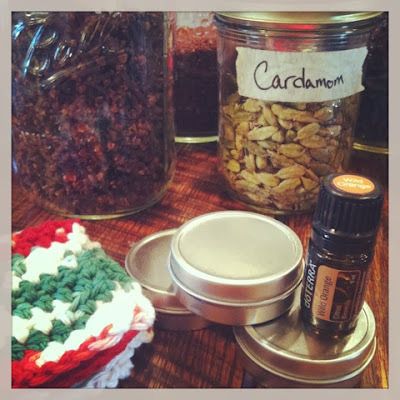 I hope that gives you a bit of confidence to try making your own lip balms!